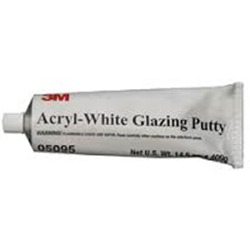 Acryl-White Glazing Putty from 3M is excellent for filling shallow scratches, pinholes, and other surface defects beneath paint. Smooth, tack-free, easy sanding spot coat for final finishing. Eliminates bleed-through problems when used as a topcoat finishing putty. Fills scratches, hairline cracks, splits, crazing, hail damage and checking. Can be applied over body filler, metal, SMC, E-coat, epoxy primers, fiberglass, and aged primers. Easy spreading putty recommended for filling minor low areas and deeper sand scratches and can be sanded in less than 30 minutes!